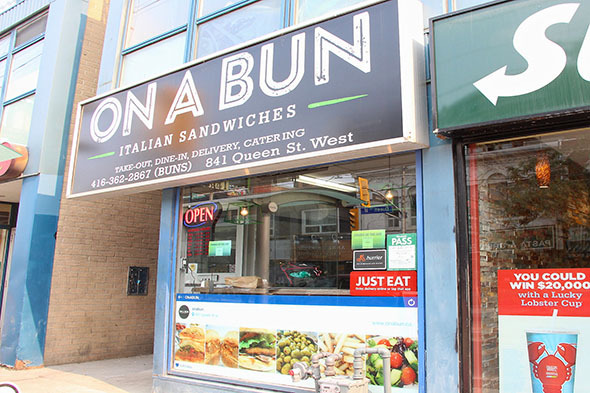 On a Bun is a rapidly expanding chain of Italian-style sandwich shops around the Golden Horseshoe. Its only downtown location is at Queen and Niagara. There are also outposts in Hamilton, Oakville and Mississauga. 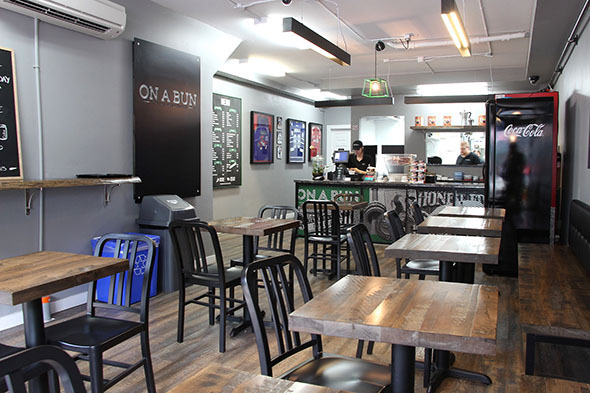 Sandwiches are, as you might imagine, the main attraction at On a Bun and come in both Junior and Regular sizes ($5-$5.25/$6.75-$7.50). Both feature the same bun, with the junior featuring half-sized, though still reasonably substantial, portions of meat or vegetables, depending on the type of sandwich you order. The buns are generally pillowy-soft, and should be familiar to anyone who has tried an Italian sandwich before. 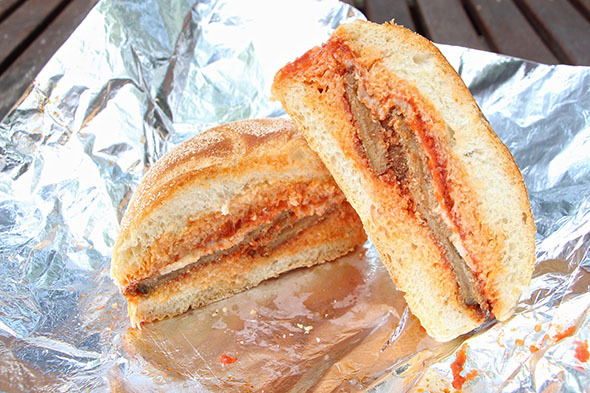 Tomato sauce, which adorns all the sandwiches, is pleasantly light and slightly sweet. The Eggplant Parmesan doesn't much evoke the taste of eggplant, which might be a good thing depending on your relationship with aubergine. 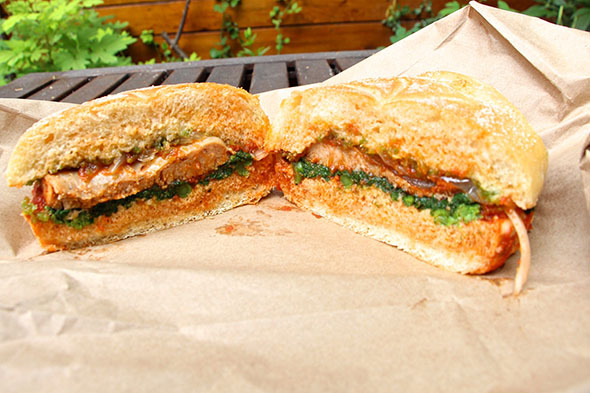 The sliced 'plant is breaded and fried up extra crispy, letting the sauce and cheese do most of the heavy lifting on the flavour side, while the breaded eggplant adds texture and depth. The resulting sandwich is meaty and tasty, and even a junior portion is a reasonably substantive sandwich. The Steak & Onions sandwich (top photo) delivers what it promises, with cooked but still firm onions adding a bit of bite along with the thinly sliced, slightly bland steak. Tomato sauce brightens things up a bit, but not quite enough to make a particularly interesting sandwich. 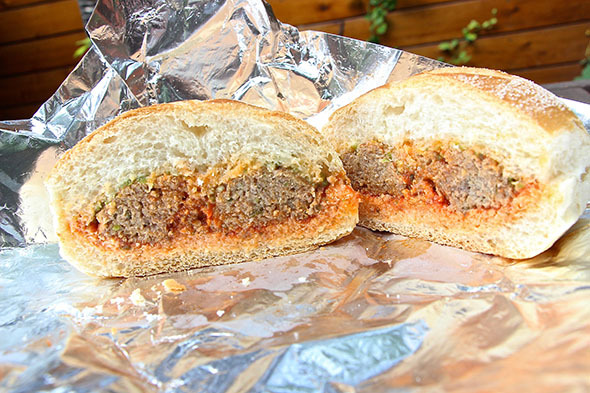 The Meatball sandwich also sits in this in-between zone - the meatballs are slightly bready with a hint of fennel, but they aren't good enough to take the sandwich anywhere particularly exciting. More successful is the Sausage and Onion sandwich, where more interesting meat succeeds in elevating the sandwich. The sausage isn't what you might think of when you think Italian sausage - it's more sweet than spicy - and ours comes well cooked and tender, spotted with tasty, slightly firm onions. Sandwiches are available in sweet, medium and spicy, with sweet being the regular tomato sauce and medium and hot featuring increasing amounts of diced jalapeno. Medium is plenty hot enough for those not seriously addicted to spice though, to the point of being quite noticeable. A variety of sides - cheese, sweet peppers, rapini, onions, mushrooms ($0.88-$1.33) are also available; the rapini we try on our sausage sandwich is a verdant green, crunchy and slightly bitter as good rapini tends to be. 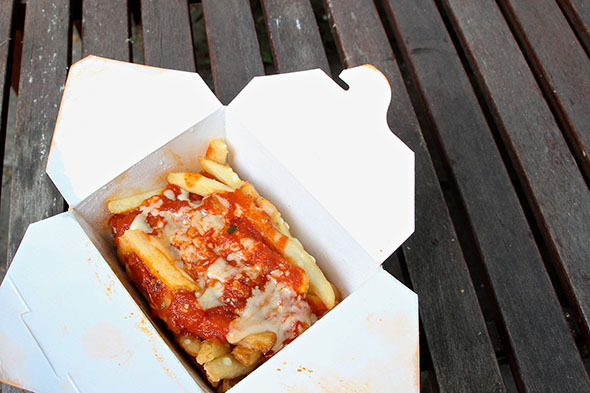 Worthy of special note is On a Bun's "Putino" ($6/$7.50), an Italian-style poutine with tomato sauce instead of gravy. Immutable food laws notwithstanding, it actually tasted about like what you would expect, a cheesy tomato sauce served with fries instead of pasta. So, pretty good. The only slight structural issue is that the more viscous tomato sauce didn't quite make its way down to the bottom of the 'tine like gravy might have, but this is correctable with some enthusiastic mixing, no doubt. 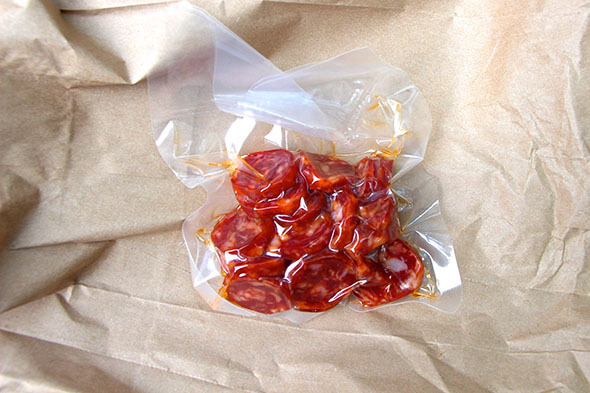 Dry Sausage ($3.75), closely resembling salami, is slightly greasy but has a bit of bite and some real flavour; it would make a pretty good snack for the road. 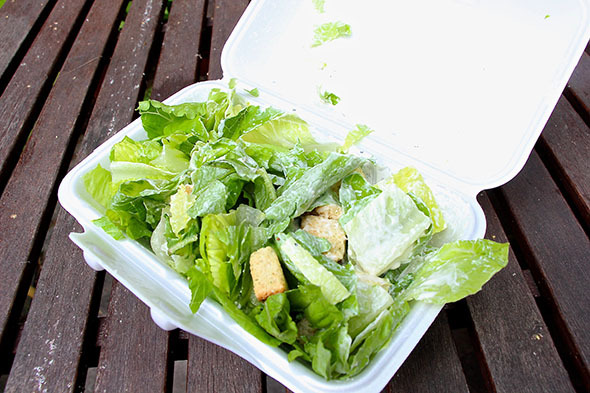 Salad ($3.50) is perfunctory - the Caesar is dry croutons, fresh romaine and packaged dressing. Even at that price you can do better. Italian sandwiches are pretty straightforward and On a Bun's are simple and feature a variety of well prepared ingredients. It's a competitive market though, especially in the Trinity Bellwoods area - with a good but not exceptional large steak sandwich running over seven dollars I'm not sure On a Bun will be able to compete on price or quality. Photos by Miranda Whist. Follow/yell at Anders on Twitter .